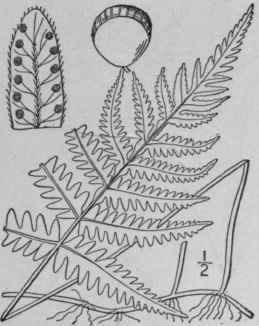 Polypodium Phegopteris L. Sp. PI. 1089. 1753. Phegopteris polypodioides Fee, Gen. Fil. 243. 1850-52. Phegopteris Phegopteris Underw. ; Small, Bull. Torr. Club, 20: 462. 1893. Dryopteris Phegopteris C. Chr. Ind. Fil. 284. 1905. Rootstock slender, creeping, somewhat chaffy. Stipes stramineous, 6'-14' long, blades triangular, thin, mostly longer than wide, 4'-9' long, 3'-8' wide, long-acuminate, pilose, especially on the veins beneath, the rachis and midribs with narrow rusty or brownish scales; pinnae close, lanceolate or linear-lanceolate, broadest above the base, acuminate, pin-nately parted nearly to the rachis into oblong obtuse entire or crenate close segments, the lowest pair deflexed; basal segments, at least those of the upper pinnae, adnate to the rachis and decurrent; sori small, near the margin, non-indusiate. Moist woods and hillsides, Newfoundland to Alaska, the mountains of Virginia, Michigan to Washington. Ascends to 4000 ft. in Vermont. Greenland, Europe and Asia. Aug. Sun-fern. Common beech-fern. 271. 1803. Phegopteris hexagonoptera Fee, Gen. Fil. 243. 1850- 52. D. hexagonoptera C. Chr. Ind. Fil. 270. 1905. Rootstock slender, creeping, chaffy, somewhat fleshy. Stipes 8'-18' long, greenish or brownish straw-colored; blades triangular, 7'-15' broad, usually broader than long, acuminate, slightly pubescent, often glandular beneath; pinnae adnate to the irregularly winged rachis, acuminate, the upper and middle ones lanceolate, pinnatifid into numerous obtuse oblong subentire or crenate segments, the lowermost pinnae broader, unequally ovate to lanceolate-ovate with the middle pinnules elongate, spaced, often deeply pinnatifid; sori mostly near the margin, non-indusiate. In dry woods and on hillsides, Quebec to Minnesota, Florida, Louisiana, Kansas and Oklahoma. 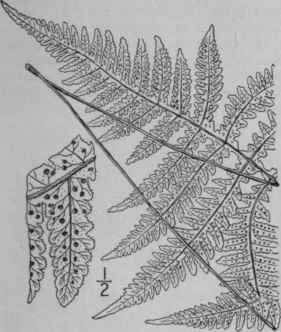 Aug. Called also Hexagon Beech-fern. 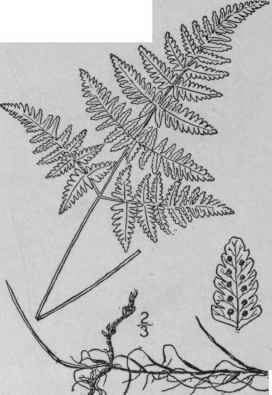 Polypodium Dryopteris L. Sp. PI. 1093. 1753. Phegopteris Dryopteris Fee. Gen. Fil. 243. 1850-52. Dryopteris Linncana C. Chr. Ind. Fil. 275. 1905. Rootstock blackish, very slender, wide-creeping. Stipes slender, straw-colored, 4'-12' long, chaffy at least below; blades thin, at right angles to the stipe, nearly or quite glabrous, 4' - 11' broad, broadly triangular, subternate by the enlargement of the basal pinnae, these triangular, very deeply 2-pinnatifid, long-stalked; second pair of pinnae oblong or deltoid-oblong, sessile and nearly pinnate, or (rarely) stalked and 2-pinnatifid; upper pinnae gradually adnate, pinnatifid; segments oblong, blunt, entire to serrate-crenate; sori near the margin, non-indusiate. In moist woods, thickets and swamps, Newfoundland and Labrador to Alaska, south to Virginia, Kansas, Colorado and Oregon. Ascends to 2400 ft. in the Catskills. Also in Greenland, Europe and Asia. 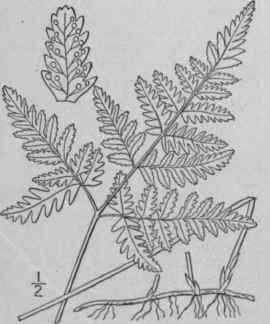 Aug. Pale-mountain, or tender three-branched-polypody.